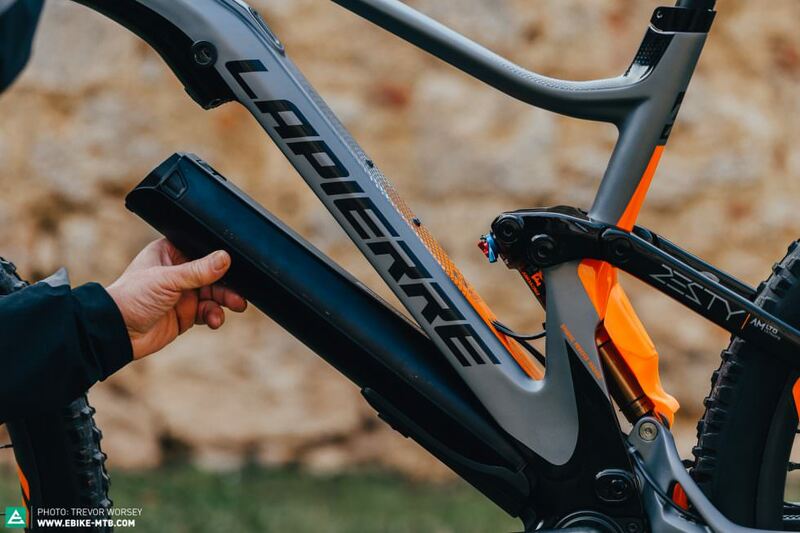 French brand, Lapierre, claims to have created a new ebike category with the eZesty AM: less weight + less power + less battery = more trail fun? Read on to find out whether their concept with the compact FAZUA Evation motor turned out successful. Before we turn to the review, we would like to introduce our new E-MOUNTAINBIKE calendar 2019, filled with gorgeous high-quality prints of our favorite E-MOUNTAINBIKE pictures. Get yours here (new window)! 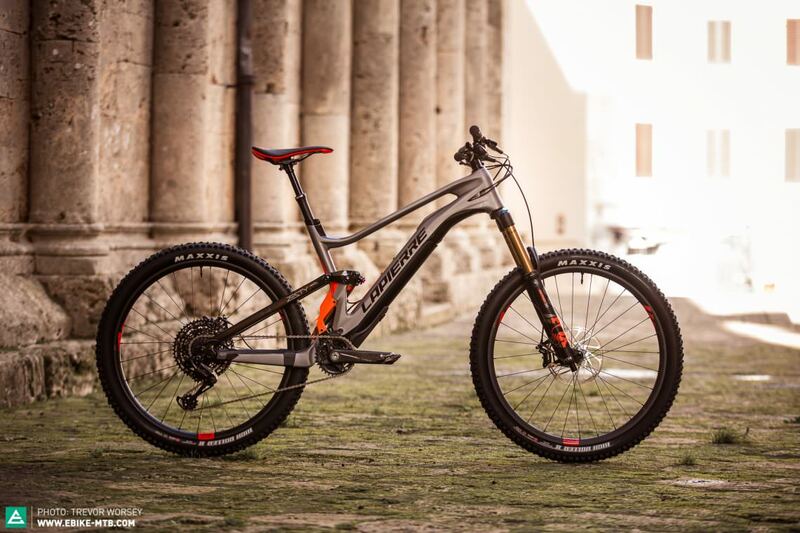 The Lapierre eZesty Am is not the first eMTB featuring the FAZUA motor; two years ago, FOCUS launched their Raven2 hardtail as the first eMTB designed around the compact and lightweight FAZUA motor. However, the marathon-oriented hardtail has its obvious limits and it’s only partially suitable for trail riding. 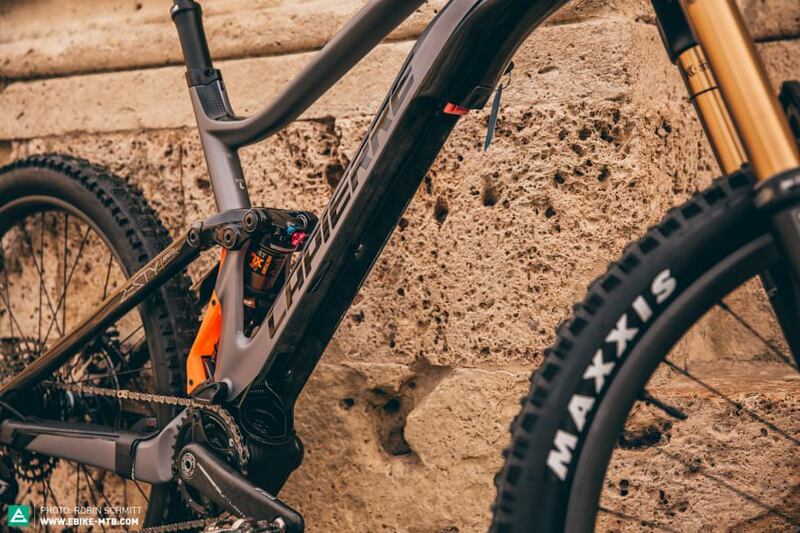 The newly presented, full-suspension Lapierre eZesty AM is the polar opposite of that, the key data of which sounds like a whale of a time on the trails! At the heart of the bike, you’ve got the FAZUA Evation 1.0 Drive Pack motor and a 250 Wh battery. Like Bosch and company, the FAZUA Evation 1.0 cuts out at speeds above 25 km/h. Thanks to the ingenious bottom bracket construction, the motor decouples from the drivetrain completely with almost no resistance either when pedalling above the 25 km/h threshold or when riding without pedal assist! The remote control doesn’t interfere with the lever of the dropper! You’re given an option of three support levels to select via the somewhat bulky and dated-looking remote control. BreezeMode offers an output of up to 125 W, RiverMode will put out up to 250 W and RocketMode will support with an output of up to 400 W. The motor kicks in only when you step on the pedals. To regulate the power, there are torque and cadence sensors on both sides of the bottom bracket, with the speed being measurement via a spoke magnet on the rear wheel. Here is the trick with the Lapierre eZesty or rather the concept of the FAZUA motor: you can easily remove the motor and the battery as a unit without the use of tools, allowing you to transform the bike into a regular, non-electric mountain-bike. This lightens the bike by around 2.8 kg. Instead of 18.4 kg (size L) the eZesty then only weighs 15.6 kg – in view of the heavy-duty componentry spec, it’s comparable to a classic Enduro bike. The drive unit simply gets replaced by an empty shell weighing a little under 500 g, which doubles as storage space. There is more than enough room for you to carry numerous bananas, a baguette (a must for the French brand!) 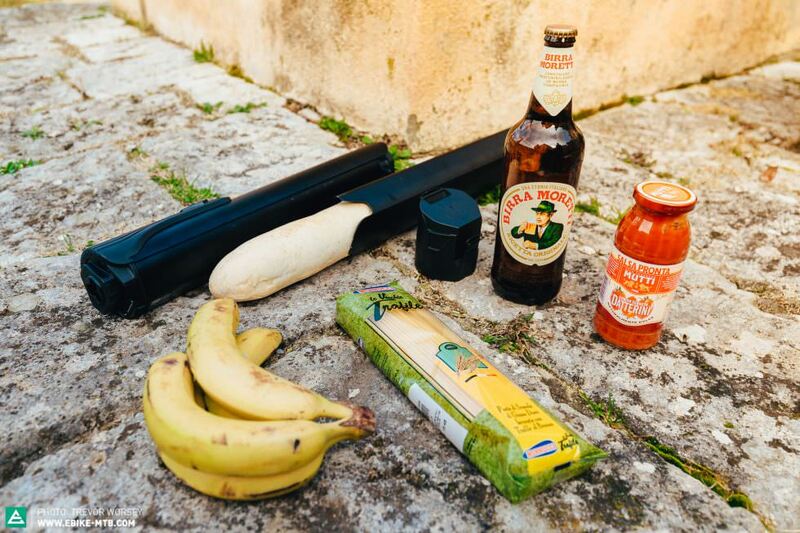 or a pack of spaghetti and tomato sauce in the empty compartment – Unfortunately, the diameter of the Moretti beer bottle is too big. If the bike stands still, the motor will automatically switch off after about 8 hours. To switch it on again you’ll have to do so via the rechargeable battery pack, in other words, you have to press the button on the top of the down tube and remove the rechargeable battery. If you regularly lock your battery, you should always make sure to take the key with you! This is particularly important in view of the fact that you have to remove the battery to charge it; there is no external charging socket. Unfortunately, the keyhole doesn’t have a cover and is exposed to mud and other kinds of dirt. 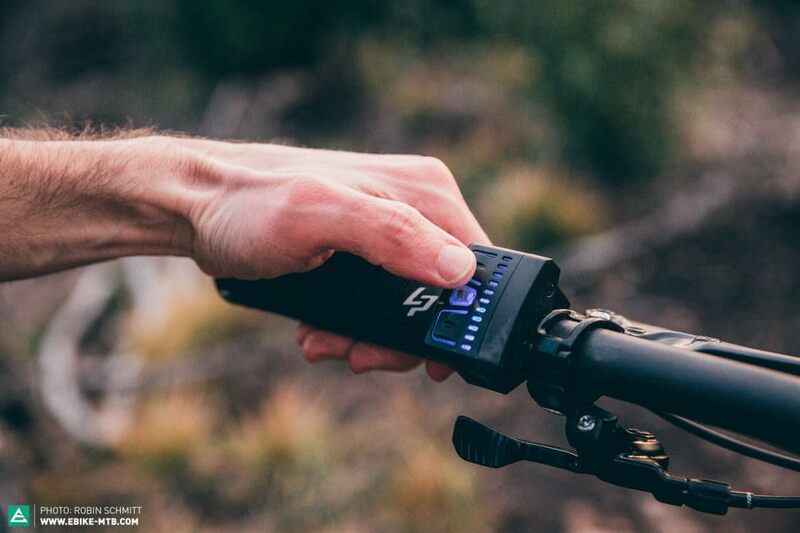 With approximately 15-20% capacity remaining in the battery, the FAZUA system automatically reduces its power output to increase the range and “safely” get the rider home. Considering the size of the battery (72 x 70 x 285 mm) and its weight (1.35 kg), carrying an additional 250 Wh battery in your backpack shouldn’t be a problem! Never heard of FAZUA before? Don’t worry, we took a look behind the scenes at the company headquarters in Munich, having won the 2018 newcomer Design & Innovation Award. By the way, FAZUA is Bavarian for “get a move on”! On the next pages you’ll find all specifications and our exclusive review.